Gardman Growbag Cane Frame Support Triple Pack provides an easy to use cane support set that fits a wide range of bamboo cane diameters. Ideally suited for growing home grown tomatoes, cucumbers or peppers ensuring they get the support they need when the plant gets tall and loaded with heavy crops. Growbag Cane Frames from Gardman are ingenious, as designed to support the underlying growbag as well as the tomato plants. Supporting the sides of the growbag, these frames allow the growbag to earth up ensuring the plants’ roots depth is maintained during growing cycle. Constructed from durable rust proof plastic coated steel, which are quick and easy to use, designed to fit any standard sized growbags. 3 x Growbag Frames supplied are the maximum able to fit underneath a single standard length growbag. 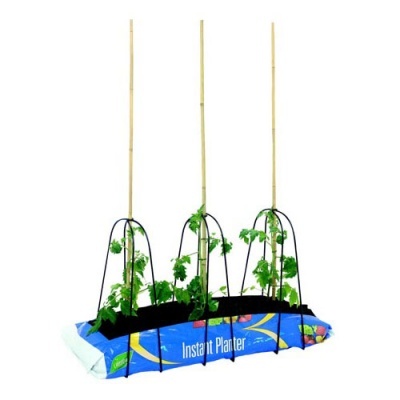 Special Note: Growbag, Plants & Canes (pictured) are not included in this set.